Who doesn't like a long solo trip on the bike? It allows you to get away and recharge. Riding alone can empower anyone for many different reasons. However, it often concerns people who love you and want to see you arrive alive. What if something happened along the way, how would anyone know? I personally have always had a person on each end of my journey who knows my route and check points to let them know my progress. That's great and a good safety measure but because I run about 200km on each leg, it would be awhile before they would even know I didn't check in. Earlier this year, AMSS was approached by an eastern Canadian company with an app that could change lives. 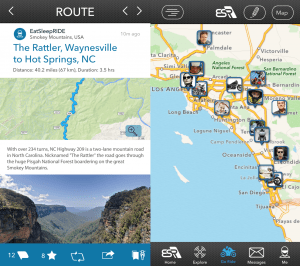 So let me introduce you to EatSleepRide, an app for your phone, developed specifically for motorcycle travel. These guys ride and are highly passionate about it, especially the safety parts of it. The best part is the app is free from both the Apple App Store and the Google Play Store. The app itself is super easy to use. You create your account and you are off and running, able to look at and share routes from other riders, getting a heads up on some of the must ride roads around where your destination is! 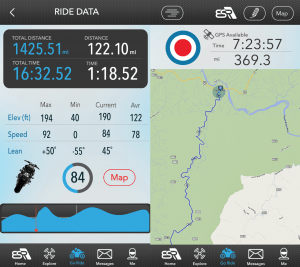 You can also see the data from your rides and analyze your speed, distance and lean angle (replaying every turn you take), helping you improve as a rider. Adding to that, you can turn on LiveTracking. What this will do is essentially leave a trail of breadcrumbs of your trip on a URL that you have sent to friends and family! They are able to check in and see where you are at! Just make sure you are recording your ride so that the URL updates for them. There is an add-on for a low price of $14.99/year which is the game changer than any normal regular GPS driven app. The add-on is called CrashLight. The folks at ESR were kind enough to let me trial run this add-on for my long trips this summer. I can tell you that I felt like I someone with me and when I hit some really questionable weather, i t allowed me to focus on my task at hand and not get caught up in the anxiety of "what if something happens". CrashLight was developed by ESR in conjunction with the University of Toronto. The coles notes on this is if you crash, it will automtically notify up to three emergency contacts with your location within 3 minutes. This app is so well designed that it can accurately detect a motorcycle crash over just simply dropping your phone. Thankfully I never had to fully use this feature of the app! Now I know there are going to be some skeptical people reading this with questions like how much battery and data does this use? This is why I wanted to run a trial so I could tell you exactly my expreience. I can tell you straight out the data usage is minimal. What I did have trouble with is battery life. I own an iphone 5s that struggles on a good day with battery life so in all reality, this has to be my phone because when I look at the statistics in my phone for the percentage of batter used by this app while it is running, it is next to nothing, low single digit percentage. There are tips and tricks like turning your battery usage to low power and turning off bluetooth that are suggested to help. In fact, if you are experiencing issues, contact ESR through the app and they will respond quite quickly with some suggestions. 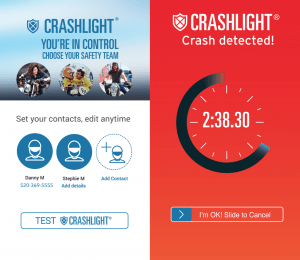 The only downfall about this app is the fact that CrashLight is dependent on a data connection to be able to send a text or phone message to your emergency contacts. So for those of us out here that love running these beautiful mountain roads, we all know that cell coverage can be very spotty. So how do you deal with that? There are a couple far more expensive solutions. inReach is the most affordable satellite communicator that allows you to both send and receive messages and will run you about $500 for the unit. Spot will run you about $120 but this unit will only send a message, doesn't allow you to receive. Overall, ESR will be able to be a great asset to the majority of riders for a very affordable price. If you are doing a lot of offroading in "no service" places, you may want to consider one of the other options if you haven't already. No matter what, ride safe, ride smart and get home in one piece.